Welcome to our August release blog hop at The Cat’s Pajamas. You should have arrived here from Swanky Stamper Joyce’s blog. If not, be sure to start at the top at Alma’s blog so you don’t miss a thing! I thought I’d give this month’s TCP Tuesday challenge to make a tall, thin card one more try. I used the new Fly High set for this one. The bunny is colored with Copic markers and cut out. To give the image some dimension, I added clear dome stickers over both the bunny’s mask and the little carrot container. The stickers create a glass-like look that’s just perfect for the image! I made an outerspace backdrop for the image with some blue cardstock stamped with the star trio found in the set and a portion of a debossed circle for a moon. Once the moon was in place, I used foam tape to put the bunny into the scene. I stamped the “fly high” sentiment under the image in black ink. The upper right corner of the scene is accented with a little pennant piece from then new CutUps Bitty Banners die set. And, here’s one more card to share with some new goodies from this release. 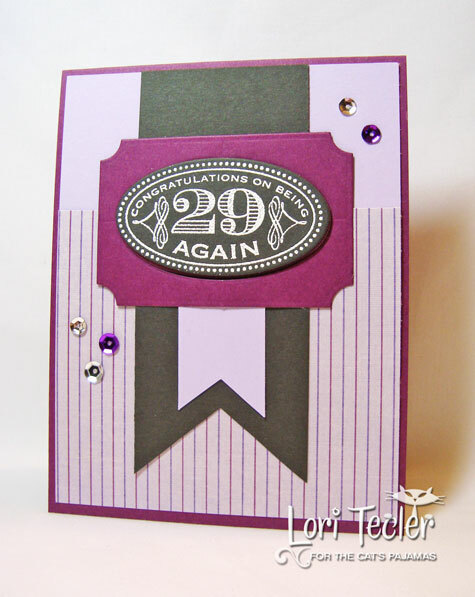 Here, I used the new Sassy Birthday set and the new CutUps Framed Up dies for a birthday card. I used the chalkboard technique for the sentiment panel. And, yes, the oval sentiment from the Sassy Birthday set fits perfectly in the oval found in the new CutUps Framed Up dies! I used foam tape to attach the sentiment to a purple panel also cut with the Framed Up dies, then attached the panel to the cardfront over a gray notch-ended strip. I accented the sentiment with some purple and silver sequins. That's all for me for now--I'm sure you'll be seeing more of the new releases here soon! Your next stop on the hop is Leigh. You don’t want to miss what she’s got to show off! 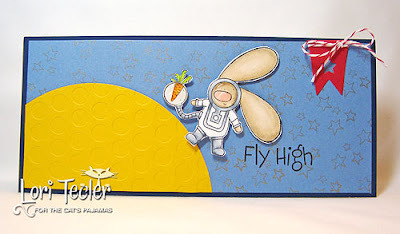 Love the little Fly High bunny and the scene you created for him! I have some serious ideas for this set when I get it! Your other card is so beautiful and elegant! Great cards! 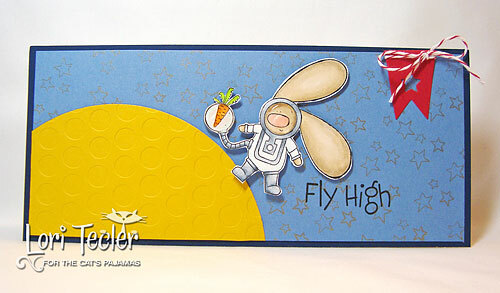 I just love the big planet with bunny astronaut! Too cute! Thanks so much for the chance to play with the Cat Pack this week! Your first card is cuteness overload !! & the 2nd is so pretty & elegant! 2 great cards -- well done!! I have to say .. The space stamp set is really fun !! Wonderful cards and so different! One elegant and one just too darn cute!